Riverbend Gardens & Nursery is full of charm as well as hostas. This is the first in a series of postings for a new blog category I’m calling Garden Nurseries Worth The Drive. Here in Southern Ontario, we’re lucky to have so many independent, creative, specialized and personal garden nurseries and–bonus–they’re often in a funky part of town or off-the-beaten track in the countryside. I’m looking forward to spending as many free days as I can hopping in the car and going on an adventure to discover fresh garden ideas, new plants, and more horticultural know-how as well as meet the fascinating people who live and breath gardening in their own unique way. AN UNEXPECTED TIP-OFF: A hosta had caught my eye at a plant sale hosted by the Toronto Botanical Garden earlier this spring. As I stood admiring it, a woman walked up to me and said “If you like hostas, you should visit Riverbend,” with just a hint of conspiracy in her voice. “Riverbend?” I asked, innocently enough. She leaned in closer as she started to give me details–rolling gardens, more hostas than you could imagine, beautiful countryside. I wanted, needed to see for myself. WORTH THE DRIVE: Riverbend Gardens & Nursery is located near the town of Listowel in North Perth, surrounded by some of the prettiest countryside I’ve ever seen in Southern Ontario–a green patchwork of farms large and small, every one neat as a pin. So the two-hour drive to get there went quickly. If your home-base is Toronto, you’d probably need three hours each way which may seem like quite a hike but there are farmers’ markets, antique stores and home-made pie and ice cream shops along the way to make the journey as fun as the destination. FIRST IMPRESSION: The entrance to Riverbend is marked by a large painted sign on the side of a gravel road. I felt a little like I was visiting someone’s home as I drove up the driveway but that’s because I was. As much as it is a specialty nursery and even a wedding destination with award-winning gardens, it’s also the home of Allan and Shirley Koch. As I got out of the car, I spotted a woman across an expanse of rolling lawn by a barn. She shouted out a hello and while I started to explore one part of a garden, she came up to greet me in a well-loved golf cart. Shirley Koch was so friendly, informative, helpful and such a hoot that I wanted to hug her at the end of my visit. WHAT’S OFFERED: Over 950 hostas as well as daylilies, lilies, peonies, specialty fruiting shrubs and heritage perennials. Many of the hosta varieties, as well as other plants offered, have been planted in rambling beds so that you can see what the plants will look like in a garden setting, their growing habit and get a sense of their size, all of which is so helpful when you’re trying to make choices. WARNING: Looking at those lush beds of hostas does not help if your plan was to buy only one plant. That was my objective. I walked away with three. Well, actually four, because this summer the nursery is giving away a free plant whenever you make a purchase. What you won’t get is the usual garden centre experience and that, I think, makes this place all the more appealing. There is no gift shop, no snack bar, no racks of fertilizers and specialty garden tools on sale. CUSTOMER SERVICE: I explained that I wanted a hosta for a spot in front of a blue spruce. After a tour of the hosta nursery to determine the types of hostas I liked, I got whisked away in that cart to see my favourites in the gardens. Having a chance to see the plants in situ was a revelation and, I’ve got to admit, riding in the cart was a huge amount of fun. When my choices were narrowed down to four, we rode over to a blue spruce and I got to see what each plant looked like next to the tree. The winner stood out like a red flag. WOULD I GO BACK? Oh, yeah. And I plan to. By the end of June the plants should be up to their full size for this growing season. I’m particularly excited about seeing the bed lining one side of the barn. When those amazing hostas, every one different, have all joined together like a long crest of erupting lushness, it will be a sight to see. PARTICULARS: Open from the first Monday in May through Labour Day Weekend. Closed Sundays. Details on how to get there as well as a full list of available hostas with prices can be found at Riverbend Gardens & Nurseries. Click on any photo below for more details and to start the slideshow. The gardens and nursery take full advantage of the idyllic countryside setting. It’s easier to choose your hosta when you can see it in a garden setting. Plants are well organized, labelled and easy to access. Choosing just one is the challenge. The variety of hostas is overwhelming; discovering their names completely entertaining. Picking out hostas can be a lesson in contrast. 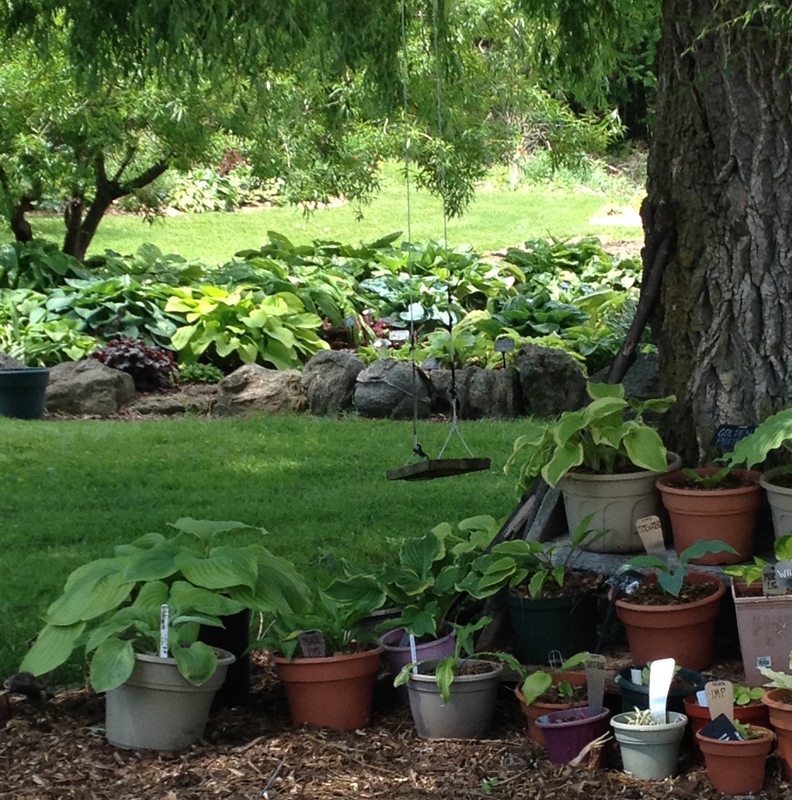 View your potential hosta picks in garden settings. A view of some of the potted hostas ready for sale. Choose from over 950 different hostas. There are more than hostas to see at Riverbend Gardens & Nursery. I’ve now got this lovely hellebore on my wish list. ← Plant an iris. Get a goddess. Really. Hi Crys! My son (and webmaster) was looking at Google Analytics and noticed the link from you blog. Thank you so much for the kind words! My son suggested I post this link on my Facebook page, but I didn’t want to do that unless I had your permission. Send a word when you get a chance, and we’ll see you in the spring! Sorry for the delay in getting back to you, Shirley! I just got back from a trip to B.C. I thoroughly enjoyed my visit to Riverbend (as I guess you noticed!) and it was my pleasure to write up the post. I hope more people come out to see you and your fabulous gardens. Please do go ahead and post the link to your Facebook page. I would be flattered. Have a great winter and, yes, you probably will see me in the spring and next time Ill be bringing friends! I want everyone to experience Riverbend. Cheers!